I’m sitting next to Spider-Man in the last car of a steam-powered train in Scranton, PA, and it’s all thanks to Donald Trump. When the Republican candidate came to Lackawanna College in July, he promised to “bring back coal” to the region. But when I asked around Scranton, people were adamant that coal wasn’t coming back. Sarah Piccini, assistant director of the Lackawanna Historical Society, says she doesn’t know any living former miners. How disappointing, I thought. I’d come to the city looking for remnants of coal country and was told to check out Steamtown National Historic site, which is how I ended up next to Spider-Man. For Halloween weekend, Steamtown was hosting rides on a coal-fired locomotive from the city’s heyday. Both coal and steel production once made Scranton a major hub of rail activity, but Steamtown is all that’s left. If you want to move around the city or get out of town nowadays, you’re taking a car or a bus. There’s a reason why Scranton didn’t join other Appalachian regions in coal’s resurgence. The region’s hard, hot-burning anthracite is shunned by refineries, which prefer softer and cheaper bituminous coal. The last Scranton mines closed in the 1960’s, and only around 120 people currently work in natural resources and mining in Lackawanna County. Democrat Hillary Clinton has called for the country “to move away from coal” last spring and has repeatedly advocated for the job-creating potential the renewable energy sector. In the Scranton area, natural gas and wind are the major energy providers, but these endeavors don’t supply work like coal once did. Fracking has mostly bypassed Scranton and takes place along the Marcellus Shale in counties to the north and west of Lackawanna County. A proposed natural gas plant northeast of Scranton in Jessup would produce 1,480 MW but supply only a few dozen well-paid positions. A 9,000-acre wind farm—the largest in the state—sits in neighboring Wyoming County and employs 11 workers. Scranton is nostalgic for coal. The city’s Masonic Temple, designed by architect Raymond Hood and now a beloved cultural center, opened in 1930 when coal money still saturated the town, says Piccini. The electric trolley that gave Scranton the moniker “electric city” was one of the first of its kind in the nation and built to carry commuting miners. Yet the coal industry was not without its problems. 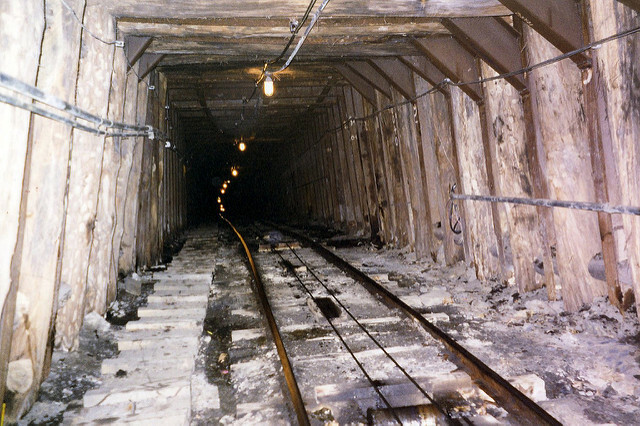 Coal mine accidents claimed 1,500 lives nationally in 1900. Even today areas of earth around Scranton occasionally cave in, events known as subsidences that are caused by the collapse of underground shafts. “If you ever live in Scranton, you want to make sure you don’t buy a house that’s over a coal mine,” said Pat McKnight, historian at Steamtown. My short train ride ended, and I left Steamtown looking for what I thought would be a better view of Scranton’s coal heritage: slope #190 of the Lackawanna Coal Mine. A group of us huddled into a yellow cage that was lowered on tracks into the cold, damp mineshaft. The children on the tour seem a bit spooked. The tour guide showed us an wooden blasting machine that once sent a charges to dynamite that blew chunks of coal from the walls of the mine. He asked the boy if he knew what the hand pump was used for, and the boys’ eyes lit up. For a moment I thought he might be recalling something—a detail from school, some piece of shared local history.